Spray large skillet with cooking spray. Beat eggs with a wire whisk in medium bowl. Pour eggs into skillet. Cook on medium heat, gently drawing mixture across bottom and sides of pan forming large curds, until eggs and thickened and no visible liquid egg remains. Spoon eggs into serving bowl. 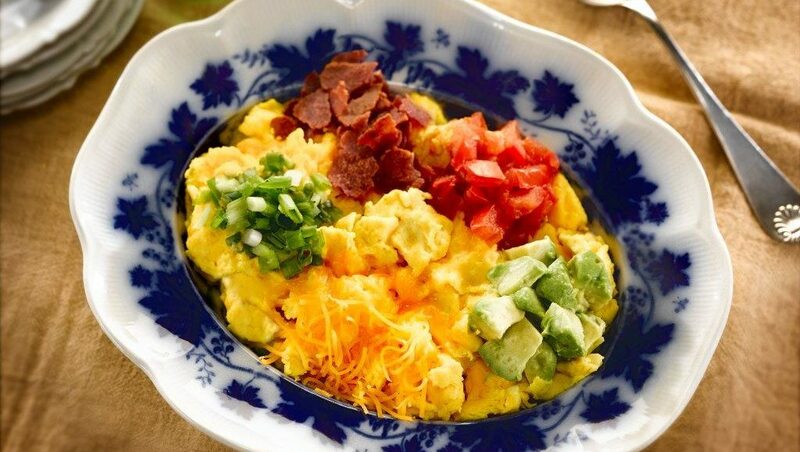 Place avocado, bacon, tomato, cheese and onions in sections on top of eggs. Substitute Monterey Jack cheese for the Cheddar and red onions for the green.